There will be some limited standing room only tickets available once the show starts at 8:00 pm for $34.50. 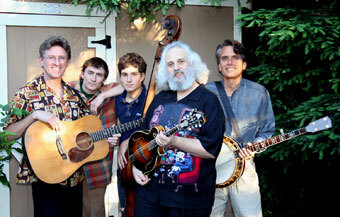 Brilliant mandolinist David Grisman has been associated with bluegrass ever since his first job as a mandolin picker back in 1964 with Red Allen and the Kentuckians. An ardent innovator, David soon gave the genre his own personal spin in the form of "dawg" music, a unique, highly intricate, harmonically advanced hybrid of so many different stylistic influences (swing, bluegrass, Latin, jazz, gypsy) that he had to invent a name for it. In addition to his own renowned groups like Old and In the Way and the David Grisman Quintet, David has played with everyone from the Grateful Dead to Stephane Grapelli to Bonnie Raitt, and has recorded more than 40 albums, five of which won Grammy nominations. David, along with Jerry Garcia, starred in the 2001 film portrait made by his daughter Gillian, Grateful Dawg. Tonight the mandolin maestro is joined by his all-star lineup of bluegrass stalwarts—Keith Little (Ricky Skaggs, Dolly Parton, the Country Gentlemen) on 5-string banjo, Jim Nunally (John Reischman & the Jaybirds) on guitar, Chad Manning on fiddle, and David's son Samson Grisman on bass—as featured on the group's recent CD, DGBX (Acoustic Disc).